I think the puffing aspect of pita bread is what scares the bejeebies out of most people who think they might, at some point in their life, want to try making pita bread on their own at home. Or maybe that’s just me since I’m pretty sure most normal people don’t go around obsessing about the pitfalls of pita bread. 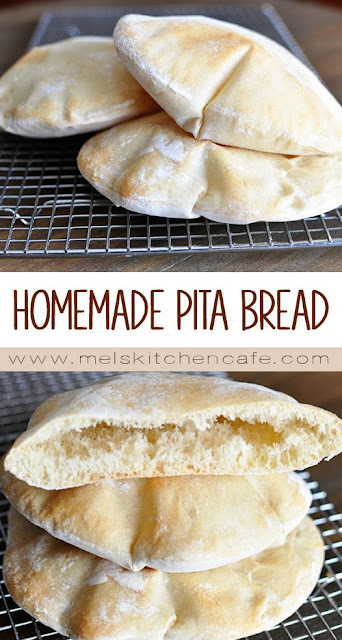 I had these epic nightmares of what would happen when all of my children had their faces pressed to the lighted oven door to watch the at-home science experiment of how pitas puff to make perfect little pockets…and I subsequently envisioned their dejected expressions when the pitas.did.not.puff. Because I was sure that would happen and that vision was definitely not going to win me mother-of-the-year award. In the bowl of a stand mixer or in a large bowl (if mixing by hand), combine the water, yeast, salt and 1 1/2 cups flour. Beat to form a soft batter-like consistency. Add additional flour until the dough starts to come together. It may look rough and shaggy at first but as it continues kneading, it will come together. Add enough flour to form a soft dough that clears the sides of the bowl (but is still slightly tacky to the touch – see the note above) and knead for 4-5 minutes with an electric mixer or 8-9 minutes by hand until the dough is smooth and elastic. Turn the dough onto a lightly floured countertop and divide the dough into six equal pieces. Roll the dough pieces into a ball shape. Lightly cover the balls of dough and let them rest for 10-15 minutes. Roll each dough ball into a thin disc, about 1/4-inch thick. Do your best to keep an even thickness throughout the entire disc of dough since this helps the dough puff in the oven (among other things). Let the pita rounds rest, lightly covered, for 30-40 minutes until they are slightly puffed.